Lock in a great price for Paradisus La Perla All Inclusive Playa Del Carmen - rated 9.1 by recent guests. Excellent Food, great staff, big rooms (some a little bit outdated), but beautiful property overall. Everything,it was fabulous and the staff were superb. All of them. Wonderful entertainment. Friendly, happy and efficient staff members. The restaurants were great quality, especially enjoyed the sushi at Bana. The swim-up rooms were very cool, great if you’re travelling with a group of friends. O lugar é perfeito. O quarto é muito espaçoso, com hidromassagem, cama muito confortável. Varias opções de culinária, todas deliciosas. Funcionários sempre perguntam se tem alergia a algum alimento antes de anotarem o pedido, e avisam qdo o prato é apimentado, sempre muito atenciosos. Pena que estivemos por poucos dias, não dando oportunidade de conhecer todos os restaurantes. Os drinks são maravilhosos, principalmente margaritas, mojito e miami vice. Sempre há eventos noturnos com músicos, para animar o ambiente. Neftali sempre muito atencioso e atendendo a pedidos especiais. Voltarei com certeza. O Resort é excepcional, os concierges e mordomos são fantástico como toda a equipe, em especial nosso muito obrigado a Elisabeth e Connie que foram mais que atenciosas, chegávamos na suíte e a cada dia uma surpresa, vinhos, pétalas de rosas, chocolates, jacuzzi preparada na varanda... Os restaurantes são superiores com bebidas de qualidade, e tantas experiências que vc nem consegue ir em todos... O único que não está incluído é o Passion do Chef Estrelado Michelin Espanhol, mas vale cada centavo gasto, foi incrível!!! O hotel tem tudo que vc possa imaginar, e uma área destinada só a adultos com SPA, programações noturnas diárias, e outro hotel ao lado só para famílias. Recomendamos 100% vcs terão uma hospedagem fantástica acreditem!!! One of our top picks in Playa del Carmen.This impressive, adults-only resort is located on Playa del Carmen’s beachfront, just metres from the world’s second largest coral reef. It offers 4 outdoor pools and luxurious, air-conditioned rooms with a private terrace. The bright rooms at the Paradisus La Perla Playa del Carmen feature modern décor, with soft tones and Caribbean colours. Each one has an iPod docking station and flat-screen satellite TV with DVD player, as well as a rain-effect shower in the bathroom. The Paradisus La Perla Resort offers no less than 14 different restaurants, ranging from contemporary Asian fusion to Mexican haute cuisine. There are also 16 bars. The resort’s spa features wet and dry saunas, and you can participate in classes including Pilates and spinning. Activities such as tango dancing, sushi-making and cocktail preparation are also available. 5th Avenue, Playa del Carmen’s main nightlife spot, is just outside the hotel. You can drive to Cancún Airport in 45 minutes. 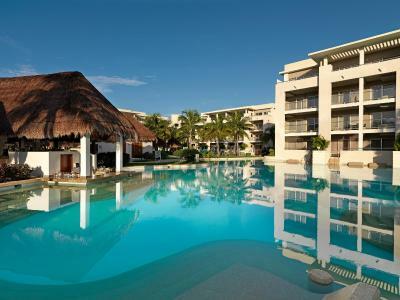 Paradisus La Perla All Inclusive Playa Del Carmen has been welcoming Booking.com guests since 19 Sept 2011. When would you like to stay at Paradisus La Perla All Inclusive Playa Del Carmen? This suite has modern furnishings and luxurious beds. The bathroom offers a rainfall shower and sensory tub. This room feature one king-size bed and offers luxury amenities. Maximum occupancy for this room is 3 adults. Maximum occupancy for this room is 3 adults. - Private beach area -Nespresso machine in the room. Suite offers a terrace with a whirlpool and private pool access. One bedroom swim up Suites feature two double beds, a separate living room area with sofa bed and kitchenette. This air-conditioned suite features a private terrace and direct swimming pool access. The bathroom has a sensory tub and double rain-effect shower. There is a terrace with a whirlpool and private access to the pool. One Bedroom Master Suites feature a king-size bed, a separate living room area with sofa bed and kitchenette with dining area. This air-conditioned suite features Caribbean decorative details and has a private 12 m² terrace. It has an extra large double bed and the bathroom contains a spa bath and 2 rain-effect showers. Paradisus Junior Suites feature one king-size bed and offer luxury amenities. Maximum occupancy for this room is 3 adults. This air-conditioned suite features a private terrace with a hot tub. The bedroom has a king-size bed, while the lounge comes with a sofa bed, flat-screen cable TV, a DVD player and a kitchenette with coffee maker. The bathroom has a sensory tub and double rain-effect shower. One Bedroom Suites feature two double beds, a separate living room area with sofa bed and kitchenette. The bathroom has a double rain-effect shower. Maximum occupancy for this room is 3 adults. This air-conditioned suite features 2 private terraces, each with a hot tub. There are 2 bedrooms and 2 bathrooms, one featuring 2 double beds and one featuring one king size bed, both with sensory tub and with rain-effect showers. The lounge offers sofa beds, flat-screen cable TV, a DVD player and a kitchenette with a dining area. Maximum occupancy for this room is 6 adults. One Bedroom Suites feature two double beds, a separate living room area with sofa bed and kitchenette. There is also a terrace complete with whirlpool. Royal Service services, access to private pool and beach. A la carte breakfast, lunch & dinner in the exclusive La Palapa Restaurant. Maximum occupancy is 3 adults. The one-bedroom master suite has a private terrace complete with whirlpool. The bathroom features a rainfall shower and sensory tub. Master Suites feature a king-size bed, a separate living room area with sofa bed and kitchenette with dining area. Royal Service services, access to private pool and beach. A la carte breakfast, lunch & dinner in the exclusive La Palapa Restaurant. This room category accepts 2 adults only, no Children Allowed, room will be assigned either Paradisus La Perla (adults only) or Paradisus La Esmeralda (family hotel) according to availability. This exclusive contemporary suite has 48 m² of space and a terrace of 10 sq. This suite features a minibar, bathrobe and CD player. House rules Paradisus La Perla All Inclusive Playa Del Carmen takes special requests - add in the next step! 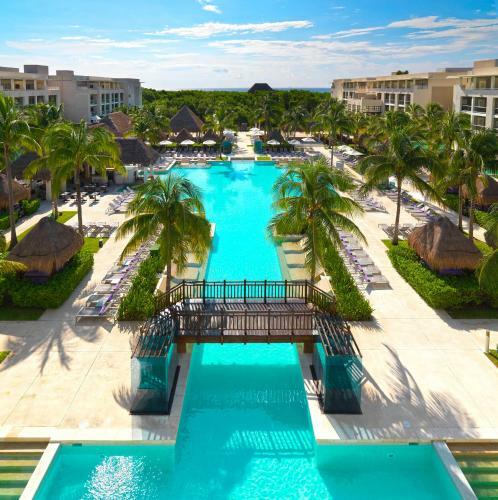 Paradisus La Perla All Inclusive Playa Del Carmen accepts these cards and reserves the right to temporarily hold an amount prior to arrival. Room Service – Included. Service charge of $5 usd per delivery applies. Royal Service and Family Concierge categories will have the service included with no extra fee. A supplement applies to book Bali Beds located at La Perla or La Esmeralda swimming pool area. Book 4 to 6 nights and receive resort credits of $550 per room, or book 7 nights or more and receive $1,500 per room in resort credits, staying from January 1st 2019 until December 22nd, 2019. Food could be better. Buffet food was cold on multiple occasions, restaurants were better but reservations are required. Staff were less than helpful and borderline rude. Food was of poor quality and had really long wait times for it to be delivered cold. Roberto at the pool bar was amazing. The beach is not very nice. If you are looking for a beach holiday, don’t come here. Take this with a grain of salt as someone who stayed at five 5-star resorts in the past. This is one of the lower grade ones. Check-in requires the same credit card you booked it with. The property is huge and it takes forever to walk. The hotel allows guests to smoke on the property which was gross. We needed a "towel card" to get a towel, talking about stingy. The beach was small and filled with seaweed — it's definitely not as nice as Cancun's beaches. The lobby and the restaurants seem cool. Room was clean. The rooms felt a bit dated and there were small things that frustrated us. For example, the air conditioning unit rattled so we had to change rooms, the shower heads didn’t have enough water pressure to rinse our hair and our hot tub on the balcony had no hot water. It was also frustrating having to book your dinner restaurants several nights in advance in order to get a table. If you book dinner earlier in the day, you likely won’t get a table until 10pm. The spa is VERY expensive and not included in your nightly price. The beach had a lot of seaweed on it, but the workers were constantly working to clean it. This is not a bad mark to the resort, but we didnt even try the beach. The attention to detail was amazing. Everyone really went above and beyond. It was my mom's birthday and they figured out what day it was and decorated our room with balloons and stuff that morning during room service. The food at every single restaurant and even the buffet were exceptional. I would totally recommend this and I will be returning. The beach had a lot of seaweed on it, but the workers were working from sun up to clean it off. This is not a bad mark to the resort. The seaweed is a natural occurrence that cannot be helped. I wish we could have swam in it more. We loved everything about this resort. We will definitely visit again. The seaweed and the smell it gave off. The food was delicious and the staff was amazing! Food was low quality. Don't get sucker into their Time Share presentation scam. The offer of a free stay is anything but free after the fine print. Hotel overall was attractive and the staff friendly. The beach was disappointing due to seaweed being everywhere and rotting. It is my understanding that this has more to do with the time of year in which we traveled (Late May). The food was excellent, and staff was wonderful attending to our every need.